Humorous Fantasy Author Jon Hollins Defends His Weekend Plans! Jon Hollins is celebrating a book release today! 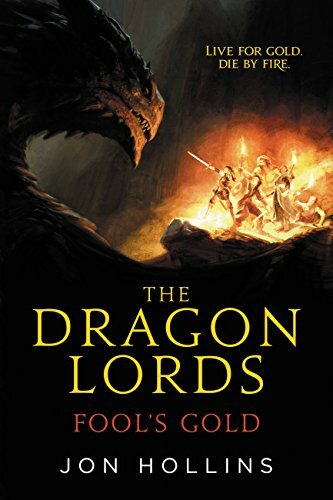 The Dragon Lords: False Idols is the second book in his Dragon Lords series after Fool's Gold, and it looks like the best of both worlds of fun and fantasy. Publisher's Weekly says that "Fans of humorous fantasy will enjoy the outrageous yet cunning plot twists of this comedy with an edge sharp enough to cut dragon scales." Jon joins us as our guest today, talking about something we would know NOTHING about here at the Once and Future website...ok, who am I kidding. You've seen our DuckTales love and what we stand for here. Let's hear it for Saturday morning cartoons! As much as I want to, I’m afraid I just can’t sit here and defend Saturday morning cartoons as high art. I’d love to tell you the colors of the Teenage Mutant Ninja Turtles’ eye bands map back to the predominant colors used by their artist namesakes, but quite frankly, I just made that up, and I can’t imagine it bearing out if you bothered to research it. Saturday morning cartoons are fluff, pure and simple. There again, that’s exactly why I love them. I came to Saturday morning cartoons pretty late in life. My parents were pretty strict when it came to TV hours (and bless them for it, because that’s where a lot of my love of reading comes from, which is where my love of writing comes from, which is why I get to waste your time with all of this today). I have my eighties favorites, of course. Transformers is still the greatest franchise to bless the face of the earth, no matter what Michael Bay has done to it. The Teenage Mutant Ninja Turtles will always be my co-pilots. However, it wasn’t until I was in my early twenties and my wife was working a job that required Saturday morning hours that I really got to fully dig into the genre. Jackie Chan adventures, Yu-Gi-Oh, and Static Shock, oh my. There isn’t much to the Saturday cartoon. That’s not a criticism, by the way. Just a comment. The formula has stayed pretty much the same since Hot Rod and Bumblebee first pushed Hasbro toys into my fumbling eight-year old fingers. It goes like this: you get your gang of friends and family together, someone screws up, hijinks ensue. And then, at the end of the show, everything is back to normal, and we’re ready to roll into next week’s episode. The simplicity of these cartoons makes them easy to criticize. This is mental taffy: it’s fun, it’s bright, it’s flavorful, and it leaves nothing of value behind in the system. Except… well, I know I just set up that straw man argument, but I don’t see anybody else around here’s who’s going to knock it down. At a basic level, there’s always been a shallow level didacticism in Saturday morning cartoons. Going back to the formula: someone in the gang usually screws up. That’s how things get started. In fixing the situation, that character usually learns the error of their ways. They’ll probably screw up again, and have to learn the lesson again (there are 20+ episodes each season, you have to give those writers a break), but along the way we learn with these characters. And because of that lesson, hopefully parents don’t feel too bad about using the TV as a babysitter for three or four hours. I’m being flippant here, because these lessons are flippant. They really are the most shallow part of these cartons, and I don’t think many of the values I hold today, I hold because Michelangelo learned that sharing the pizza was important. Saturday morning cartoons do teach some lessons more effectively, though. Going back to the structure one more time (I’m sorry, I’m a structure nerd, writing has done bad things to me): someone in the gang screws up. The gang. It may be friends, it may be family, it could be a bunch of stoners hanging out in a van trying to solve mysteries. Whoever it is, there’s a bunch of people there who love and care for each other. And where one of their members screws up, or gives into a weakness, or indulges a foible, they rally together and they sort things out. And, yes, I get that isn’t a profound lesson, but Saturday morning cartoons teach it profoundly. The loyalty of friends and family is ingrained in their DNA. You cannot help but soak it in. Friends are there for friends. Family is there for family. This is the sort of stuff that knits societies together, and as I look around at this world, that sort of empathy seems more and more important to me. And still, beyond even that, there is a more simple reason I love Saturday morning cartoons. Beyond their obvious lessons, and their implicit assumptions about the world. It’s something integral to their existence, and it is this: Saturday morning cartoons are fluff; Saturday morning cartoons are mental taffy; Saturday morning cartoons are just fun. When I first graduated college, I noticed an odd thing: I wasn’t finishing any books I started to read. I would abandon almost all of them halfway through, sometimes earlier. And when I figured out why, I felt pretty stupid.. I was reading the sorts of things, I thought I was supposed to read. I was reading the books that I thought would make me smarter, would make me think about the world more deeply, or make me more educated on subjects. I had stopped reading for fun. I think it’s easy to become very self-conscious about what we do for fun. We don’t want to be uncool. We don't want to be shallow. And, yes, I get that trying to become smarter, and thinking about the world more deeply, and getting more educated are all important, noble things to do, but they aren’t the only things we should try to do. They are not everything. We get just one shot at life, and there will be plenty of teleconferences along the way. It’s up to us to make sure we have some fun too. And sometimes, it can be pure, and Technicolor, and watched on TV with a bowl of Fruit Loops on your lap. So I still can’t defend Saturday morning cartoons as high art, but I can still defend them. Saturday morning cartoons are great. And they aren’t great because of the lessons they try to teach, or the values they implicitly embody. They are great because they are unapologetically fun. They are dumb, and goofy, but they are fun. It’s their raison d’etre. And yes, I’m using French so you can justify yourself to judgmental friends when you emerge bleary-eyed, with Cheetos in your beard at midday, but I am passionate about this. Unlike Trix, fun isn’t just for kids. So let’s do this. Let’s sit down, let’s tune in, and let’s have fun. Jon Hollins is the author of The Dragon Lords series. Fool's Gold and False Idols have both received starred reviews from Publisher's Weekly, and Bad Faith is due out next year. Jon Hollins is also a lie. He's a pseudonym for urban fantasy author Jonathan Wood, whose debut fantasy No Hero was described by Barnes and Noble as one of the top ten paranormal fantasies of the past ten years. Guardians of the Galaxy meets The Hobbit in this rollicking fantasy adventure series. The Dragons who once ruled over the land are dead. The motley crew that stumbled through that revolution are rich and praised as saviors. Everyone gets to live happily ever after, right?